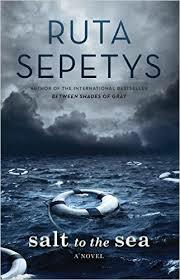 Ruta Sepetys’ most recent work Salt to Sea is a very well written historic novel– accurate in its description of time and place with mostly fictional characters that are based on real people’s lives and experiences. It illustrates the evacuation of East Prussia in January of 1945, a miserable winter towards the end of WWII when Germans, Estonians, Lithuanians, Latvians, Poles and other groups of Eastern Europeans were fleeing west to avoid the feared atrocities of the advancing Russian troops. The long route is filled with hunger, cold, desperation, violence but also with acts of humanity, decency and love. The journey in this novel culminates in the worst ship sinking ever, one the world has barely heard about. We meet three of the refugees up close: Florian, a young Prussian man on a mysterious mission; Emilia, a brave Polish teen and Joana, a young nurse from Lithuania. As we slowly find out, each of them carries a burdensome past but also motivation and hope for the future. A fourth main character is Alfred, a young German soldier trapped in his delusional view of the world. Their paths intersect during the boarding process for the MS Gustloff, a German cruise ship put in service to transport about 10,000 refugees from Gotenhafen to Kiel. Their fates are intertwined, and the story stays gripping to the end. The novel goes back and forth between the perspectives of these four characters. The writing is straight forward and easy to read which makes for a good contrast to the horrors it describes. It allows the reader to absorb the events and one cannot help but get emotionally involved. Yes, Salt to Sea depicts events that happened more than 70 years ago, very important by itself as the Gustloff’s and its passengers’ fate finally needed to be told more broadly to the world. Additionally, to me though, the story is very affecting and carries relevance today, especially in light of a new refugee crisis due to another war. This novel is classified as a Young Adult book, but I prefer the word “crossover” as Ruta Sepetys used on her website – as this book should be read across all ages, nationalities and beliefs. Just reserved this at the library! Sounds like a great read.